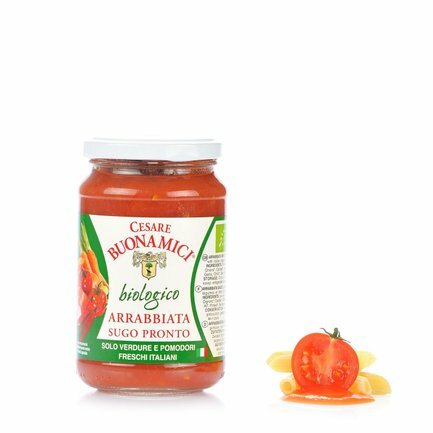 The goodness of the best organic ingredients can be found in this flavourful Buonamici sauce. It is made with fresh selected Italian tomatoes together with high-quality extra virgin olive oil made from Tuscan olives, onion, carrots, celery, basil, garlic, chili and sea salt. The result is an inviting arrabbiata sauce, made according to tradition. Ingredients tomato juice and pulp 87.5%, olive, onion, carrot, celery, extra virgin olive oil, basil, garlic, chilli pepper, sea salt. Allergens: celery For more information on product labels, please contact our Customer Service department. The information on the labels of the products may vary for reasons beyond our control, therefore, there may be discrepancies between the information on the site and that on the products delivered. Please always check the information on the product before consumption or use.